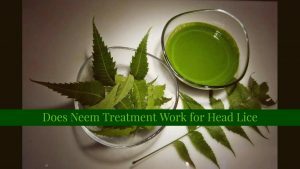 Does Neem Treatment Work for Head Lice? Head lice are parasites that live on the scalp, hair, and ears which feed on the blood. It is one of the common problems faced by children. A person or child can get head lice infestation through head to head contact, sharing hair care products like combs and wearing clothing of people who have the head lice. Though head lice spread from one person to another, they don’t spread or carry any disease with them. They reproduce very quickly. A female louse can lay up to 10 eggs per day. They hatch in 5 days and become mature to lay eggs in another 5 – 7 days. It requires patience and regular inspection for completely eliminating these stubborn head lice. For example, they live up to 6 hours under the water and live up to 24 hours without human contact. One of the biggest problems about head lice removal is that lice have become resistant to many chemical based or over the counter solutions. Even chlorine present in swimming pools is not able to remove the head lice. But don’t worry. Home remedies are still the most effective methods and safe to eliminate head lice infestation. Does Neem or Neem Oil Work for Head Lice Removal? Neem or neem oil contains an insecticidal ingredient called azadirachtin which disrupts the reproduction and growth of head lice. It restrains the swallowing systems of lice which starve them to death. Lice don’t like the pungent smell of neem oil which restricts its crawling into your head. The healing and soothing properties of it will reduce the irritation and itching. Apart from dealing with head lice, it helps to add shine to your hair and moisture to your scalp. How to Use Neem Oil for Head Lice Removal? Both neem leaves and neem oil can be used to treat head lice infestation. The methods don’t cause any damage to your scalp and hair. In fact, they help in strengthening the hair and prevent the hair loss. We have mentioned different remedies below. Try any method as per your convenience. The below methods need fresh or dried neem leaves. If you have fresh neem leaves, you can dry them and store for regular use. Take a handful of neem leaves and boil them in 2 glasses of water. Let it boil until the liquid turns into green. Remove from the flame, strain and let it cool down. After regular shampoo, use this neem water to rinse your hair 2- 3 times. Repeat the process once in 3 days. Grind handful of neem leaves into a paste. Rinse off the water with shampoo and lukewarm water. Alternatively, you can blend boiled neem leaves. Blend some dried neem leaves into a fine powder or use store bought neem leaves powder. Combine neem powder and enough amounts of water to make a thick paste. Apply it to the scalp and along the hair. Wash your hair normally with shampoo. Use only pure neem oil while trying the below methods. It provides effective results in removing the lice and restricts premature greying of the hair. Add neem oil to your regular shampoo and mix well. Use this shampoo to rinse and wash your hair. Alternatively, you can use a shampoo that contains neem extracts. Wash and dry your hair thoroughly. Apply undiluted neem oil to the hair and along the hair. Let it stay for few minutes. Now the comb along the hair to remove the head lice. For extra benefits, use a comb that is meant for head lice removal. The fatty content present in coconut oil suffocates the lice. The lubricating nature of it restricts its crawling on the scalp. Mix few drops of neem oil into enough amounts of coconut oil. Repeat the process once in 2 – 3 days for at least one month. Alternatively, you can use olive instead of coconut oil. Tea tree oil contains an insecticidal property which kills and prevents head lice infestation. It soothes the irritation caused by scratching. Olive oil suffocates the head lice. Combine 1 part tea tree oil and 4 parts neem oil. Add 2 teaspoons of olive oil and mix well. Apply the solution into the scalp and along the hair. Now comb the hair thoroughly to remove the lice. Sesame oil contains antibacterial and natural pesticide properties which deal with the head lice. Apart from that, it also helps in hair growth. Rinse your hair with dilute apple cider vinegar and let it dry completely. In a bowl, mix 1/8 cup neem oil, 1/4 cup of sesame oil, 1 teaspoon tea tree oil, 10 drops each of lavender oil, eucalyptus oil, and rosemary essential oil. Stir the ingredients well and apply it into the scalp and along the hair. Cover the hair with shower cap and let it stay overnight. In the morning, comb the hair thoroughly to remove the head lice. Repeat the process once in 3 days until the hair is head lice free. Quick Tip: For kids less than 5 years reduce the essential oil quantity to 5 drops each. Olive oil suffocates head lice by depriving them of oxygen which makes it easy to remove them by combing. Combine 2 ounces of olive oil and 15 – 20 drops of neem oil. Mix well and apply it onto the scalp and along the hair. Leave it on for at least 12 hours. Comb through the hair to remove the head lice. Rinse off normally and let it dry completely. Tea tree oil contains pesticide properties which kill the head lice. Apart from that it soothes the irritated scalp and encourages hair growth. This process helps to prevent the head lice infestation. Combine neem oil, tea tree oil, and lavender oil. Spray the solution onto the hair. Note: You can spray the solution onto your kid’s hair before going to school to prevent the infestation. If you are allergic to neem then avoid using it. Try the remedies regularly to get rid of head lice completely. As head lice spread from one person to another, it is better to avoid head to head contact and share personal belongings with a person who is infested with head lice. Wash the bed sheets, clothes, towels, hats and scarves regularly if you have an infestation. Seats in airplane, theatre and public transport can have head lice so cover them with your sweatshirt or jacket before you sit. Repeat the process regularly which ensures the newly born head lice are removed. To prevent the infestation, try to use the methods once in a while. We hope you liked the article. If you have any queries or suggestion, write to us in the comments section below. For more such articles, stay tuned with our website. How to remove my lice ? You can try any method mentioned above in the article. As head lice cannot be treated completely in one sitting, we recommend repeating the process regularly for at least few times to get rid of head lice. How to acne nd acne marks remove ? I have small pores due to acne and boils . Please suggest me some home remedies to reduce them.I also have a small white patched mark near my eyebrows please do suggest some remedies.